The Return of the Unexpected - Computational Photography exhibition opens on Friday 11 March, with an opening event at 18-20. We are currently building the exhibition and quite excited about the four featured projects (more info). As a special opening treat the authors of Portraits of a Machine, Wolfgang Bittner and Stijn Belle are bringing an alternative Saccades version of their installation to the opening of the exhibition. In Saccades, direct feedback of the visitors gaze is used for creating a photographic portrait. An art model wearing an eye-tracking device looks at her own mirror image. 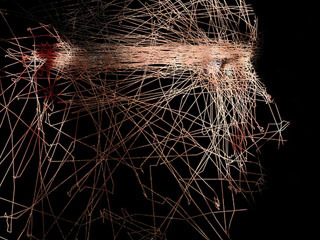 Her eye movements are recorded and they serve as the input for a computer software which draws fragments of the face in response to the eye movement. See you in the opening!